It's THAT time again... Time to send out a quick update via TinyLetter. I'll probably write another before the end of the year... Gotta sum up this awesome year for TBD! For now my latest newsletter includes info about 2015 Crafternoons, the go! West Coast tv segment and details about my upcoming segment on CBC's The Early Edition. That happens this Tuesday around 8:30am. Hope you can listen in! 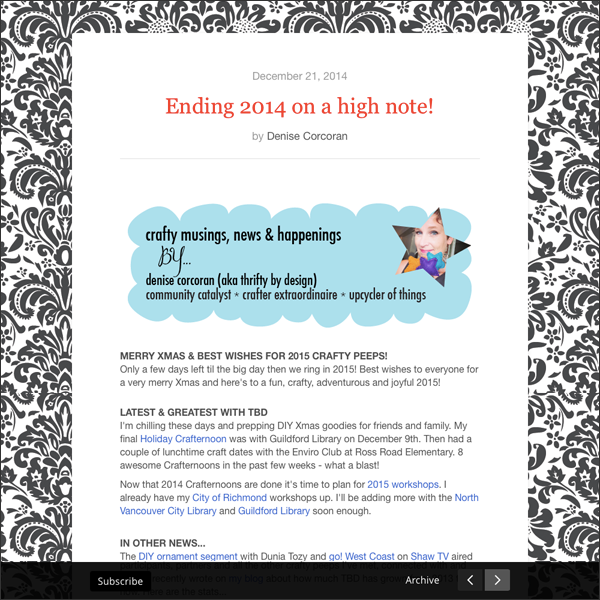 Find my latest TBD newsletter at 'Ending 2014 on a high note!'. Subscribe to my TinyLetter newsletter or view the archives at www.tinyletter.com/ThriftyByDesign. You can now find TBD on YouTube! Hitting a record with Crafternoons!